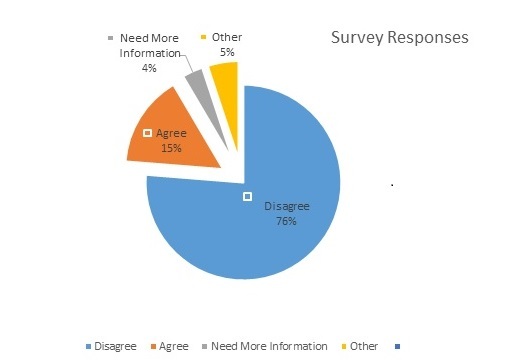 We wanted to thank the many residents who responded to our survey about reducing the size of City Council to 25 members, and in particular, for offering the many comments to explain your position. A large majority of respondents objected to the reduction in the number of Council members, mostly because they felt that the new size of the wards would significantly impact the level of representation needed in the city. They also felt that Premier Ford’s claim of “for the people” rang hollow since he had not consulted with Toronto residents beforehand and respondents suspected Ford had singled out the City of Toronto for council reduction as a personal vendetta. The comments in favour of a smaller council were almost exclusively related to the sense that City Council tended to be slow in making important and necessary decisions and councillors engaged too much in self-promotion during debates. SERRA’s position continues to be that a reduction in council members will seriously affect our level of representation, which in an area like ours with all its development stress will be a significant loss. Early this week a critical debate at City Council will help determine whether the City will attempt to oppose the council reduction in the courts, but we do expect that prospective councillor candidates cannot afford to await the outcome of such a challenge and instead will start to declare their interest in running as if for a “25-member” council. We will continue to send out further communications as this election unfolds. Again, thank you for your responses and interest. 76 percent of respondents disagree with the changes to city council. 15 percent agree with the reduced numbers. 4 percent wanted more information. 5 percent wanted to see some reductions to council, but felt the 25 was too much of a reduction. The Province of Ontario’s Bill 5, the Better Local Government Act, 2018 has received Royal Assent on August 14, 2018, resulting in the reduction of the number of Toronto City wards from 47 to 25. The Toronto City Council boundaries have now been aligned with federal and provincial electoral ridings. These changes will be in effect for the October 22, 2018 municipal election. Click here to read the news release. The new wards for the city of Toronto are now available online. The agenda items for the special city council meeting for Monday, August 20, 2018 are now available on the City of Toronto website. Click here to see the agenda. City Council will be asking legal counsel to provide information about the legal options to challenge Bill 5, the Better Local Government Act, 2018. Click here to read the background information. 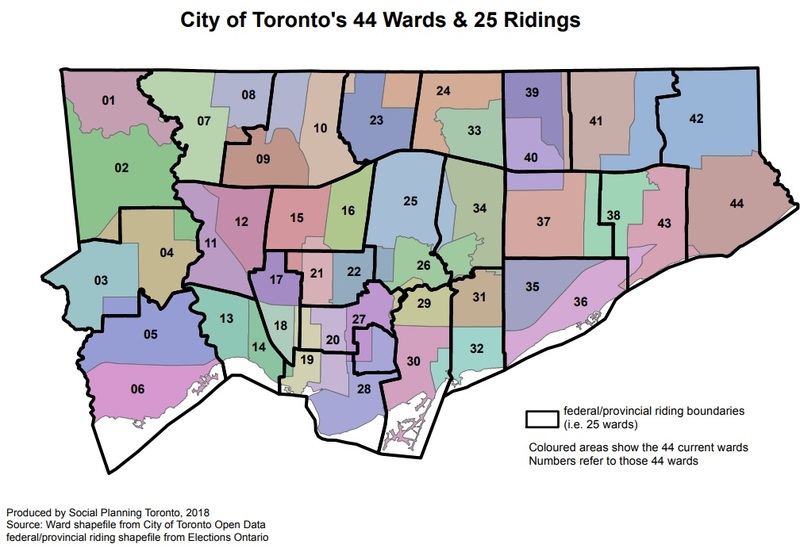 The map below shows the 25 fed/provincial ridings overlayed with the recent City of Toronto 44 ward structure. This map was created by Beth Wilson. SERRA will be split between St. Paul’s (west of Mt. Pleasant Rd.) & Don Valley West (east of Mt. Pleasant Rd), however, as we mentioned in our previous communication we are keeping our residents’ association boundaries as they are today. We will continue to represent Davisville Village and South Eglinton residents as we have been for more than 50 years. The official Toronto District School Board (TDSB) ward boundaries are now available on the City of Toronto elections page. Click here to see the TDSB ward map. The Toronto District School Board (TDSB) considered several ward boundary options and selected option 1.1, outlined on page 5 of this TDSB report. For up to date information and news releases please visit the TDSB website. 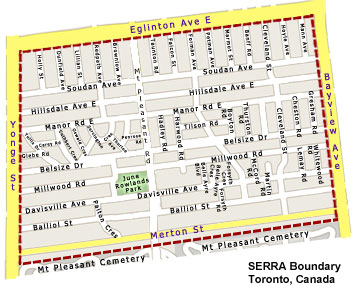 The SERRA neighbourhoods will have two TDSB wards, one for the schools on the west side of Mt. Pleasant Rd., and another for schools on the east side of Mt. Pleasant Rd. Ward 8 is a newly created ward and combines part of St. Paul’s (west of Mt.Peasant Rd.) and Eglinton Lawrence. Ward 11 includes schools in part of St. Paul’s (east of Mt.Peasant Rd.) and Don Valley West. Below is a closer look at the ward boundaries (Wards 8 & 11). The full map can be found on page 5 (option 1.1) of this TDSB report. TDSB Ward 8 – Local TDSB schools in the SERRA neighbourhood include: Eglinton Junior Public School, Davisville Junior Public School, and Spectrum Alternative Senior Public School. TDSB Ward 11 – Local TDSB schools in the SERRA neighbourhood include: Maurice Cody Junior Public School and Hodgson Middle School. 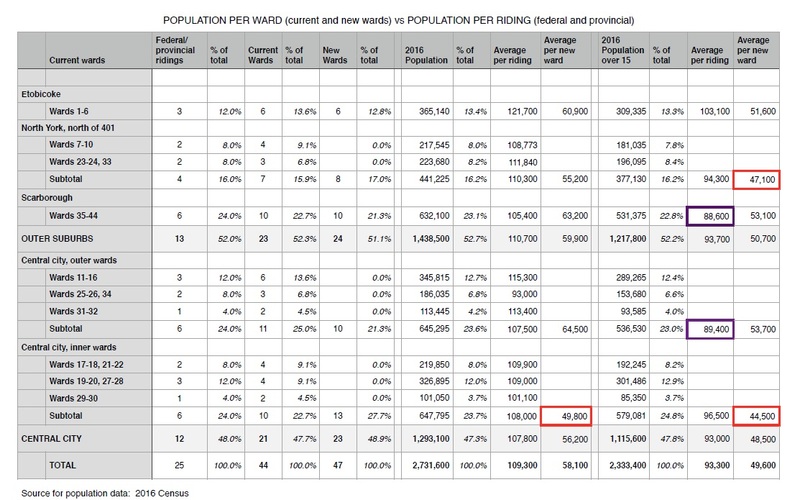 The population per ward (current 44 and new 47) vs. the population per the 25 ridings (federal and provincial) are outlined in this chart.